Here’s a fact, It’s hard to beat a good omelet. This tasty and popular food has earned its place on breakfast tables around the world. And it’s not just for breakfast. Omelets make a delicious and nutritious meal that you can eat any time of day. Part of the appeal of an omelet is its versatility. Besides eggs, you can add almost anything to an omelet. They’re the ultimate in customizable food. When made correctly, omelets can be surprisingly healthy. They taste great, too. Not only that, but omelets are easy enough to make that children can be taught how to do it (Source). A simple frying pan is all you need to start producing omelets. However, if you want better results that can stand up to your local breakfast diner, you need a designated omelet maker. These machines make a simple dish even easier to make. Read on to see what the best omelet makers currently available have to offer. 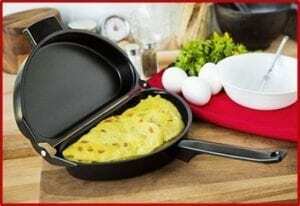 This electric omelette maker from Holstein can cook two omelets at a time, making it helpful for bigger families. What’s even better is it can cook the omelets in as little as 10 minutes. Hence, it is ideal for those with busy morning routines and suitable as an omelet station equipment for restaurants. Additionally, the design of this omelet maker gives the food it produces a unique petal shape. 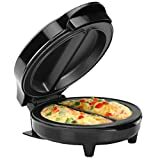 Once the device has reached the proper cooking temperature, all you need to do is pour your omelet mix into this equipment’s two compartments and close the lid. Moreover, the omelets produced by the Holstein are pleasantly light, fluffy, and thoroughly cooked due to the hot plates it has. While the metal plates have a non-stick coating, it is still recommended that the unit is sprayed with a light coat of oil before use. Overall, this device is a small omelet maker and is great for saving counter space. However, its compact design means smaller omelets produced. Its capacity to produce two omelets at a time helps to offset this somewhat, but families with bigger appetites may find themselves unsatisfied. Non-stick plates for easy cleaning. No on/off switch – unit must be unplugged to turn it off. This omelet maker offers something a little different from most other options available on the market. In fact, this simple device meets the same need in an innovative way. Unlike the electric omelet makers on this list, the Lekue has no power supply. Instead, the device itself is a microwave oven-safe dish into which you pour the omelet mixture and then cook it in the oven. 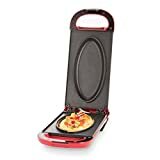 Additionally, this foldable silicon device will fit even in a kitchen drawer, which makes it the best microwave omelet maker for small kitchens. Plus, by using your existing oven as a heat source, it allows for a far smaller footprint than an electric omelet maker. Furthermore, this product cooks omelets without any oil at all, which makes it healthy, oil-saving, and perfect for health-conscious people. Of course, this device doesn’t offer any fancy features like a timer or an alarm. But if you’re pressed for space, this omelet maker could be the answer to your prayers. Oven-safe silicon resists high temperatures. Takes up very little space in your kitchen. Allows for omelets to be made with no oil. 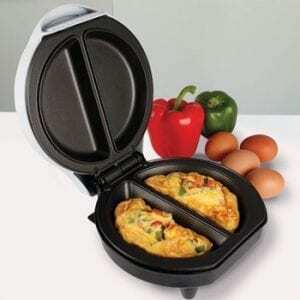 Very affordable – multiple units could be used to make four or six omelets at a time. No timers, alarms, or other advanced features. Requires the use of a regular microwave oven. 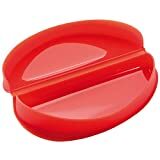 Starting it of with a bold red color and a sleek design, this omelet maker stands out from the crowd; it has some design features that set it apart from its competitors. First, the Dash omelet maker gets rid of uneven cooking by making the machine flippable. Halfway through cooking, you can simply turn this two-pound unit over. Even better, this device offers more than mere omelet making. It can be used to make frittata or calzone or to sear salmon and grill sandwiches. Its low profile won’t take up much space on your kitchen countertop, too. However, the Dash omelet maker can only make one omelet at a time. Hence, if you live alone or as part of a couple, this may be fine. But if you have a family to feed, this unit may struggle to keep up. Low profile design saves space. Can cook other than just omelets. Can only make one omelet at a time. Cuisinart is a long-established name in the appliance market. This hefty machine has all the build quality you would expect from a well-known brand – and a price tag to match. To introduce this amazing product, the Cuisinart will take up a lot of counter space, but the manufacturers have decided to embrace that aspect of their machine by making an attractive-looking appliance of a stainless style. In doing this, they have ensured that this omelet maker will stand out in anyone’s kitchen. Moreover, this is more than a mere round omelet maker. This high-end machine can also handle waffles, pancakes, fried eggs, grilled sandwiches, sausages, and fritters. It’s almost like having full-scale diner equipment in your kitchen. Additionally, the Breakfast Express is packed with astounding features like browning control, temperature adjustment, temperature indicator, and an alarm. Hence, if you take your breakfast seriously, this might be the machine for you. On the other hand, the cost and size of the Breakfast Express make it impractical for smaller kitchens and more limited budgets. Can cook a wide array of breakfast food. Advanced features such as browning control, temperature adjustment, and timer. The large machine takes up a lot of counter space. With its ability to make two omelets at a time, the Better Chef Omelette Maker can be a real time-saver for busy families. Just pour your omelet mixture into the shaped metal plate and the machine will do the rest. The high cooking heat of this device ensures light and fluffy omelets that taste great. Plus, it has multiple design color options to choose from so that you can make sure the omelet maker matches your kitchen. In addition to that, the best part of this omelet maker is its non-stick property. The heating plates of this device are coated with a Teflon substance, which makes cleaning a breeze and ensures your food won’t stick to the cooking surface. Still, you’ll want to apply a few drops of oil from time to time to maintain the non-stick feature. As for cleaning this unit, all you need to do is wipe it down with a damp cloth after use. However, make sure to wait for it to cool down first to not damage the cooking surface. This omelet maker doesn’t have any special features like browning control or temperature adjustment. All it does is make omelets. But it does that well, and the ease of cleaning makes it a good choice for those who only need something more simple and easy to use. Makes omelets two at a time. Non-stick plates prevent sticking and burning. Lacks advanced features offered by other models. It can only make omelets. Before rushing out to buy another kitchen appliance, it’s worth taking some time to consider what features you need in an omelet maker. Really, there is no point paying extra money for more than you need. At the same time, you want a device that can make your life easier while being simple to use. We’re talking about food, so the way the finished product tastes is the ultimate standard by which an omelet maker should be judged. It sounds obvious, but it’s a point worth making. If an electric omelet maker has all the latest features but produces lackluster food, it’s just going to end up gathering dust in a cupboard somewhere. Hence, make sure the omelet maker you choose makes omelets the way you like them. Mornings are often one of the busiest and most hectic times of the day. The whole point of an omelet maker is to reduce the time and effort you spend making a healthy breakfast. To make anything well will always require a certain amount of time. But the quicker the machine you choose can cook an omelet, the more useful it will be during that crazy morning rush. How many omelets do you want to make at a time? For those with large families, more is better. However, note that bigger machines can be more expensive. Meanwhile, if you’re the only omelet eater in your household, a machine that can produce a single omelet may be more than enough. Let’s admit it, it’s all too easy to overbuy appliances for our kitchens. Most of us have single-use items gathering dust in the back of a cabinet that we regret buying. Usually, the more functions an appliance has, the easier it is to justify the expense of acquiring it and the space it takes up. If you have a family with diverse tastes, consider buying machines that can also help make pancakes, fritters, and sandwiches. Some models feature advanced settings such as alarms and timers that can help you to avoid over or under cooking. Others have browning control that can help make an omelet just the way you like it. These features are nice to have, but they can add extra bucks to an omelet maker. Hence, if it’s something you need, go for it. If not, don’t. Cooking inevitably means cleaning. But an omelet maker that is hard to clean is one that you will quickly find yourself reluctant to use. If the machine that’s supposed to save you cooking time ends up being a nightmare to clean, you’ll soon regret your purchase. Therefore, look for an omelet maker with a non-stick surface. Some models offer removable plates that significantly improve the cleaning process. Keep in mind that you’re buying a machine to help you, not to give you another chore to perform. Think carefully about the features you really need and the ones you can do without. Think also about how often you eat omelets and how much use any machine you buy will be getting. There’s more at stake than just money, especially for those with smaller kitchens. The last thing you need is another appliance that doesn’t see enough use to justify its place in your home. 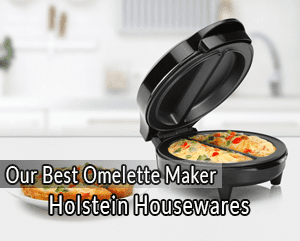 However, the right omelet maker can really speed things along in the morning or whenever you choose to make an omelet for yourself or your family. So, give one of these omelet makers a try and see how much time they can save you in the kitchen. I have used Holstein Housewares, this very frequently since getting it. The omelets are a bit small but very tasty, so we usually plan on eating several for a meal. So many variations can be made quite easily.